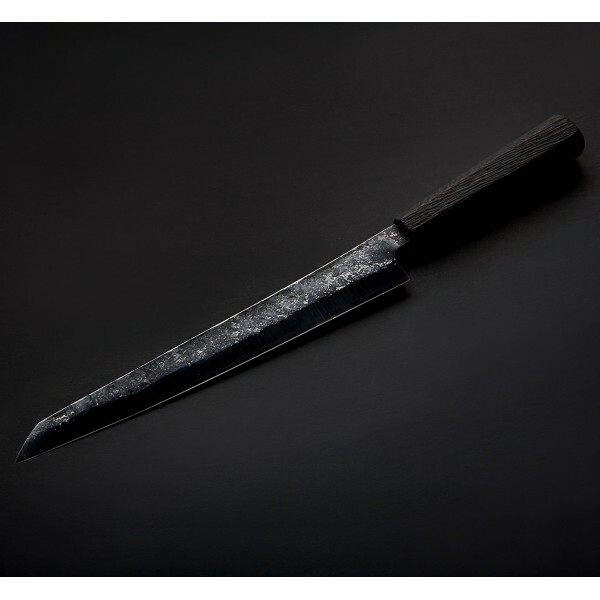 Forged from Bryan Raquin's full carbon house-made san mai is this thin, sharp 270mm Sujihiki with a burnt oak handle. 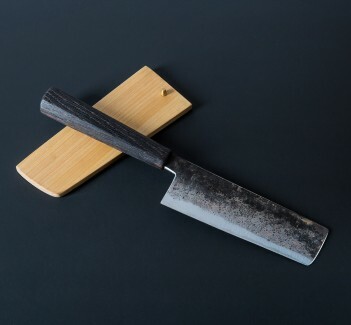 Finished by Bryan on Japanese wet stones, the blade made from "super-clean" 145sc and XC10 carbon steels is hardened during heat treatment to 63-64 HRC and comes protected by a handmade wooden saya. Bryan adds a slight lift to the handles of his Sujihikis, creating an angle as the handle extends from the straight spine of the blade, providing just enough knuckle clearance to easily manipulate the long blade which measures just 38mm tall at the heel in the case of this beautiful 270mm knife. 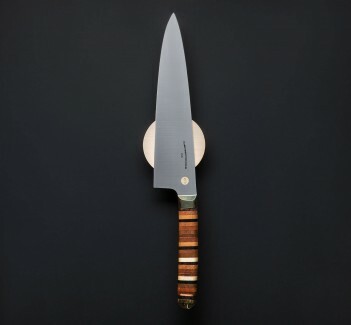 Bryan's san mai steel proves itself time and time again, offering a thin, hard edge that stays sharp, cut after cut, while maintaining the feel in the hand that so many chefs love, a result of the softer steel cladding which helps provide a "softer" feel when cutting. 270mm blade overall length, 266mm (10.5") cutting edge. Blade width at the heel: 3.6mm. Blade width 1" from the tip: 2.0mm. Blade height at heel: 38mm.